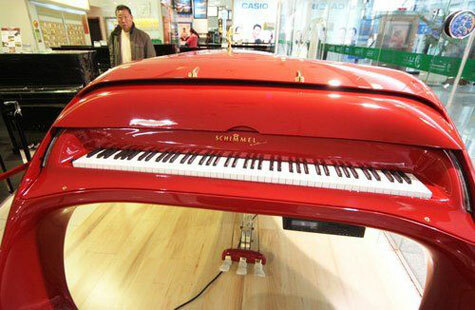 A piano, shaped like Ferrari, is displayed in a piano shop for sale in Beijing, March 12, 2009. 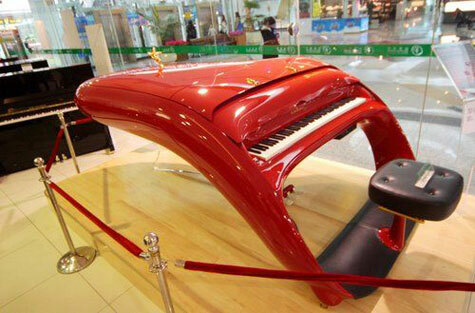 The piano version of the world’s only cross the production, transmission from Germany and German Piano family together produced a well-known designers, the overall use of the red Ferrari racing craft paint color, smooth lines, a strong dynamic. As a result of the digital sound system and the microcomputer control system, no one to play at, the piano keys to jump on their own interpretation. Prices in China up to more than 228 million yuan. Fantastic design, very nice thanks.